We’re Seattle bound! Not today, but soon; and I’m really excited because Washington is one state I’ve always wanted to visit but just never did. The thing is, I’ve been busy and haven’t had time to do any research. Normally, I map out our days hour by hour so we can cover as much territory as possible. We never stick to the plan and I never expect that we will, but I like going places with an idea of what we need to see first and where we can get the best food. My friend Lizzie has been helpful, but if you have any other suggestions (best cupcakes in Seattle, maybe? things to do with kids? ), I’d really appreciate the input. 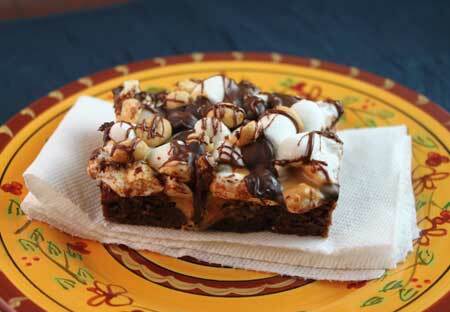 In return, here’s a recipe for Rocky Road Peanut Butter Brownies. It doesn’t have anything to do with Seattle, but you can serve it with up with coffee. Extra milk or dark chocolate for melting and drizzling. In a microwave-safe mixing bowl, melt the butter. Stir in the cocoa and let the mixture cool. When cool, stir in the sugar, flour and salt and mix with a wooden spoon. Crack in the eggs, one by one and beat with the spoon, then beat in the vanilla until the mixture is well-blended. Pour into the pan and bake for 20 minutes or until top appears set. Remove from the oven and let cool for about 10 minutes. Warm peanut butter for 10 seconds in the microwave and spread it over the brownies. Sprinkle marshmallows, chocolate chips and peanuts over the peanut butter layer. Return the oven and bake for 3-4 minutes or just until marshmallows puff up. Let cool at room temperature. If desired, melt some milk or dark chocolate in the microwave using 50% power. Drizzle melted chocolate over the rocky road topping. Let cool completely, then put in the refrigerator. When chilled, lift from pan and cut into 16 squares. Deeeelicious. My husband won’t stop eating them, and I mainly made them for me! We were in Seattle six years ago and I think we managed to hit most of the places that have been suggested so far. There is also a Science Fiction Museum near the Music Experience exhibit that my husband and daughters really enjoyed. We went to the library, Pike Place, original Starbucks, underground Seattle, the Space Needle, the boat to the island. If you like seafood there was a place on the waterfront that I’ve seen on TV (The Crab Pot) where we ate and my daughter and husband got a huge bowl of seafood that they dump onto the table and they give you bibs and hammers. It was pricy but worth it as we have good memories. We loved Seattle. We were there for a week and it never rained! Very hilly though. I wasn’t expecting that. Pike Place Market for sure! My favorite things there are the Sur la table store, a great clam chowder place (that I can’t remeber the name of, sorry! but it’s not far from Sur la table, up the hill on an alley parallel to the main market street), the mini donuts, and the tea store with the cinnamon tea! If it’s a nice night, going to a Mariner’s baseball game is always fun! I forgot to mention I like that the salty pb is not mixed in with anything sweet. The bars look like state fair blue ribbon winners with the varying textures and colors. Like Calico brownies! wow what a great twist on a regular brownie! that cookie is a whole lot of happiness right there! Julie, Katie from Two Sisters in the Kitchen just baked the brownies and reviewed them. I liked them and so did she, so that’s two votes of confidence :). As for Bake Sales, I agree that they’d be great. One tip is to freeze them or at least partially freeze them before cutting. I always freeze Rocky Road topped baked goods before slicing because it gives you such a cleaner cut. Katie, thanks for the review! And Mackenzie, thanks for the well wishes. Karen, there’s no way we can go to Seattle without hitting that “Mcphee” store. That’s like Fuzz’s dream shopping venue. Melissa, I will be sure to post ALL the picks. Maybe we’ll see some whales…. Michael-Ann, thanks for taking the time to ask your daughter for tips. I really hope we have time to visit that Science Center. Sue, Alex, Anonymous and Lili — glad to hear more endorsements for Pike Place. Sounds like a I picked the right location for our hotel. Dawn, I’ll try to meet up with your grandparents. Just kidding. Anon, I’d never heard of Cinnamon Works until you mentioned it. Must go. Bethany, I couldn’t go to Seattle without paying homage to Starbuck’s either. Sorry you didn’t get to do everything, but that’s good in a way because it motivates you to go back. We took a ferry to the San Juan Island. There is a park there called Lime Kiln Point State Park where you can see orca whales. Amazing experience. Driving up to Mt. Rainier and seeing Snoqualmie Falls were also a couple of our favorites. I have some Seattle tips since I get up there fairly often to visit family. I haven’t been since they moved locations, but my daughter had a kick there when we visited when she was about Fuzz’s age. Make sure to visit the Fremont Troll! We preferred Trophy Cupcakes to Cupcake Royale, we bought 6 of each and did a taste-off and Trophy was the clear winner. Serious Pie for pizza was outstanding. Also do recommend Dahlia bakery, it wasn’t that big in terms of offerings, but the mini pies are first rate. Summer is berry season in Washington, make sure to enjoy them! Kidd Valley is a small chain of burger joints and they have delicious raspberry and blackberry milkshakes – highly recommended!!! 3 years ago we celebrated my daughter’s 15th birthday with dinner in the restaurant of the space needle and we had a wonderful time. It was a gorgeous clear day and it was worth every penny! People left little notes along the outer rim of the restaurant, so as we turned we got little messages, some with questions like “where are you from.” It was a lot of fun. These look good! Have fun in Seattle! Anna- no Seattle tips for you, but I wanted to tell you I made these decadent brownies last night and they are FABULOUS! I almost used special dark cocoa powder, but after tasting them I am glad I didn’t. I also didn’t use a chocolate drizzle- these are plenty chocolatey on their own. Thanks for the recipe- they are a hit at work! We’ve never been but Jamie has a the Lego Space Needle! Thanks for all the great ideas! I’m taking all these down and putting as many as I can into our schedule. I’d like to see some rain. I’ve forgotten what it looks like. Hope the weather gets better before you get here! Just asked my daughter (age 8) what she likes to do when we are in Seattle-she says Pike Place Market, Nordstrom, Top Pot Doughnuts, Pacific Science Center. Riding the ferry boats is fun too. I like Macrina Bakery. There is a “Ride the Ducks” tour of Seattle-we have never done it, but the kids always want to do it. I’m sure it’s probably a little cheesy, but might be fun for kids. Ray’s Boathouse is a great setting, but I don’t think the food is that great, we were just there a couple of weeks ago. All of the other ideas posted look good too, I’m going to take some notes for next time we go! I’ve never been to Seattle but my daughter has and off the top of my head I can clearly remember her talking about Pikes Place Market and a ferry ride. She was a poor college student at that time visiting a friend/also poor college student. you must go to Pike Place, there are some great restaurants there..but in the market they have the most awesome mini-donuts! delish. Seattle: visit Magnolia, University Ave (delicious food! ), Bellevue Library (huge library with so many books!). Greenlake is beautiful and it’s an easy afternoon walk around the lake. Gasworks park and Lake Union are beautiful. Space Needle is always a must 🙂 Try some coffee and donuts + buy fresh flowers at Pikes Place Market. pike’s place is the place to get a good range of foods. seattle is a good place to eat and eat. my grandparents lived on magnolia blvd; that’s a pretty area for views of mt rainer. have fun! lucky you. Just went to Seattle and did a lot of research on places to eat – some that I loved were: Beecher’s Cheese Shop (mac and cheese, grilled cheese, french onion soup – great quick lunch at Pike Place), Cafe Besalu and Le Panier (amazing croissants), CinnamonWorks (Pike Place, amazing monster cookie). Portage Bay Cafe is fun for over-the-top breakfast. Crush was great for dinner. Also heard good things about Matt’s in the Market and Ray’s Boathouse for seafood, but didn’t get to try them this trip. Dahlia Bakery is supposed to have good baked goods. It’s a great city – enjoy! From looking at these comments apparently I missed all the cool stuff when I went to Seattle last year… We did pay homage at the original Starbucks in Pike Place market, just to say we did. A big part of our trip was going on a whale watching boat from San Juan island, but that would take up a couple days of your trip. Have a great time! Amy, yes! And they’re hiring. Not to rain on your parade, but the restaurant in the Space Needle is overpriced & not that great. When I was in Seattle last fall we took the food tour at the Pike Place market & it was great. We stayed in Bellevue (20 min east) & had a car – which I recommend. There are great parks there – Mercer Slough Environmental Education Center has canoeing through a bog, a blueberry farm & lots of activities that Fuzz would enjoy. We spent one night in Bainbridge at the Best Western – nice & reasonably priced. The ferry ride over is great. We visited the Duwamish Tribe longhouse which was very educational. http://www.duwamishtribe.org/ That should get you started! I’d agree with all who recommended Pike Place Market and any of the ferry suggestions. Also, if you have a car and the time, take a drive to Leavenworth — it’s a beautiful drive and Leavenworth is a fun town modeled after a Swiss village. An alternative would be a drive going West on the North Cascades Highway, which is also beautiful. It’s one of those drives where you want to pull over after every curve because the views are so beautiful. Sorry I don’t have any restaurant or bakery recommendations. I hope the mountain is out while you are there! I’ve never been to Seattle either–it’s on my list. Have fun, I’m sure you will. Isn’t Cakespy in/from Seattle. She’d have all the ins/outs for cupcakes/bakeries. I have a feeling you already thought of that/her anyway. One more place to try is Top Pot donuts! Lots of variety and awesome lattes! I don’t have any Seattle tips, but did you know that Austin is getting a Penzeys? It is supposed to open at 4400 N. Lamar sometime in Sept.
Only a couple more comments: You should reserve a clear day (if you get one) to go to Mount Rainier..the drive and the mountain are breathtakingly gorgeous. Also, Ivars Salmon House has food for non fish eaters too! It is a bit pricey. We went to the Hoh rain forest area in Olympic Nat’l Park. I love one bowl recipes! I think I need to make these brownies soon. Thanks for the recipe. These look so good! Why is chocolate and PB such a good combo. I have never been to Seattle but have always wanted to go as well- can’t wait to see what tasty eats you try! A lot of people like the Experience Music Project (I’ve never been). Simply Desserts in Fremont used to make GREAT cakes (available by the slice). Tutta Bella is good for pizza and Chinooks is a nice, reasonable place for very fresh seafood. None of these places are in downtown, though, so you’d need a car. Hope you have a fabulous trip!! A nice ferry ride ro Bainbridge island is what I would recommend. You won’t need to take a car either. Hop on the ferry in downtown Seattle and it drops you about a half mile from the main town. I would recommend Cafe Nola for a great meal but call first for reservations. Between the ferry and Cafe Nola are tons of cute shops for browsing. There is also a children’s museum but your daughter may be too old for that??? You could also do a tour of Theo Chocolates which is fun for kids and adults! There are also boat tours to Blake island (leaves from the Seattle waterfront) and you are served a traditional Native American meal on the island. Things like cedar planked salmon, clams etc. My favorite cupcake place is Cupcake Royale but you might be interested in checking out Tom Douglas’s bakery called the Dahlia bakery and is located in the heart of Seattle. I would definitely recommend a visit to Uwajimaya in the Intl district too. It is huge Asian grocery store with lots of things to see and try! In their food court, I would recommend Beard Papa’s cream puffs….they are delicious! We do have one restaurant reservation already, and that’s at Sky City up in the Space Needle. Anna, with the underground city tour, you literally walk around Seattle one story underground. Sidewalks and all. I almost suggested you go to one of the restaurants over by the fishing docks, then I remembered who I’m speaking to. Louise, thanks! I will have to read more about the park. That sounds like our kind of thing. Susan, thanks for the tip! I’ll let you know if we go there. Gloria, yes — it was just moderating the links. Don’t worry, I can Google the names of the things you mention. I’ve never heard of the underground city tour, but that sounds really interesting. My comment is being moderated…not sure why but I did include some web links. Here’s my comment without the web links! 5. Driving up to Mount Rainier which looks like a snow cone if you can see it. 7. Taking a ferry somewhere-Victoria, BC is not too far and it has the butchart gardens. Kind of depends on how long a trip you have planned. If you love pizza you should try Delancy, owned by Molly Wizenberg (of Orangette) and her hubby, Brandon. Would love to hear back how it was! My husband is on a plane to Seattle right now. He’ll be going motorcycle riding with a friend. We’ve been to Seattle many times. Off the top of my head, I’d say Pike Place Market, Underground Seattle, and the Boeing Museum. If you have a lot of time, there are great things to see in Olympic National Park. Oooooo, this might have to be the next brownie recipe I try! Looks and sounds delicious!